All of us have memories to reflect upon which reveal insight into how we became who we are today. More often than not these memories are remembered as brief moments. Muhammad Ali, our Champ as we know him, came into being through such a defining moment that it completely changed the course of then twelve-year-old Cassius Clay’s life. For Ali, his moment came when his red Schwinn bike was stolen in October of 1954. The legend of Muhammad Ali was born out of that Red Bike Moment©. Though Ali’s story may be singular, it is a fact that each and every one of us has a story to tell. While it is indeed our mission here at the Center to preserve and promote the Champ’s legacy, it is also our hope that visitors and guests will use Muhammad’s Red Bike Moment© as fodder for recognizing their own. If individuals are inspired by Muhammad’s story, they may be more open and able to recognize when these fleeting, yet monumental forks in the road occur in their own lives. In the modern day it is now easier than ever to share life lessons, memories, and personal tales that have the power to reach across oceans, teach, and inspire. With today’s ease of communication, we are able to collectively use it for good. Chances are that you have a story that surely could affect another person on the other side of the world. Have you had a Red Bike Moment©? This may be a story that provides insight, a new perspective, or wisdom that may help guide someone else. Your Red Bike Moment© can be large or small. It may be globally impactful or personally transformational. If it has had a pronounced impact on your life in any way, it counts. Please share your stories via Facebook. Simply post a video of you telling your story OR through written form with a photo (if appropriate) and tag the Muhammad Ali Center (thus sharing it with the world)! 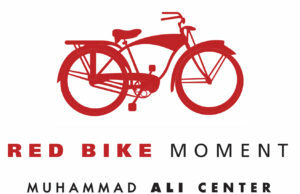 Along with this call to action through social media, the Muhammad Ali Center has also installed a new multimedia exhibit where you are invited to come and record your Red Bike Moment to be archived here at the Center. Some have shared tales of their personal struggles when they lost a beloved family member. Others have traveled from other countries and told their stories. One man shared his memory of being the only black kid on his Little League team during the age of Martin Luther King Jr. Despite pitchers on other teams routinely trying to hit him with their pitches when he was at bat, he willed himself to play the entirety of the season. Many Red Bike Moments© are intensely personal, and are simple declarations of freedom from past burdens, or small steps to a brighter future. Whatever the case may be, your story has the power to inspire and you have the opportunity to share it. While the world so often focuses solely on the negative, your stories could provide direction and hope. With your help, this young generation can continue to inspire and be inspired. With your help, today’s young generation- or any generation- may know that the people who came before them have a story to tell, a lesson to demonstrate, a point to make, and a life changing moment to reflect upon. Sharing a story is the first step to communication, which ultimately leads to understanding, and cooperation. That is the true legacy of Muhammad Ali. That, is the power of a red Schwinn bike.